There is a bedroom and it is on the same floor, so no stair to contend with at night. Amenities: We have a full kitchen, full bathroom with shower and hair dryer, Cal-King size Bed, Free Wi-Fi internet, Washer/Dryer, 37' flat screen LCD TV with cable, telephone with unlimited US long distance and a Home Theater System with 5 disc CD/DVD Changer. We are only steps away from the Pool that overlooks the ocean. Two Beach chairs and Beach Towels are available as well as a Hair Dryer. *Visit the Historic Leper Colony by mule, plane or foot-a truly remarkable journey you will never forget. *Hike through the Rain Forest. *Visit secluded beaches where you are the only ones there. *Rent mountain bike on the expansive Molokai Ranch. *View the highest sea cliffs in Hawaii Islands. We love the beautiful things in life and when we saw this unit and it's location we knew we had to have it. This condo was set up nicely — well stocked kitchen with plenty of pans and devices plus a very comfortable king bed and good sized washer/dryer. It was roomy and comfortable for us two. However, the real beauty was what was just outside! The view from the lanai would be difficult to find anywhere due to the proximity to the ocean (it’s RIGHT there) combined with the near emptiness of the beach. Watching the waves exploding on nearby Kaiaka Rock is as dramatic as the constant crashing waves are restful. We are grateful that Don and Jackie allowed us to experience this slice of wild beauty. We look forward to sharing the aloha again. Everything you would expect Molokai to be.. Location of the condo is spectacular! Beautiful sunsets, crashing ocean waves, fantastic beach and pool. Jeanette, thank you so much for the great review. We love our place more when we get to share it through other people's eyes. So little time, so much to see! We loved your delightful villa, your friendly island and had all that we needed. Thank you for allowing us to rent! Beautiful location, condo, grounds. A special ‘shout out’ to Julie P., Property Manager and Robin (we never met him) the BC trumpet musician who played every evening at sunset 🌅, such a bonus we could never have anticipated - and made every effort to be on site for the evening event. Happy that there’s a comprehensive convenience store on the grounds for various sundries! Some vehicle issues w car rented from Dana Kish- would not recommend his rental service. Thank you, Mahalo. A dream break!! Our second time here and will be back. Comfortable, well appointed condo with a spectacular view! 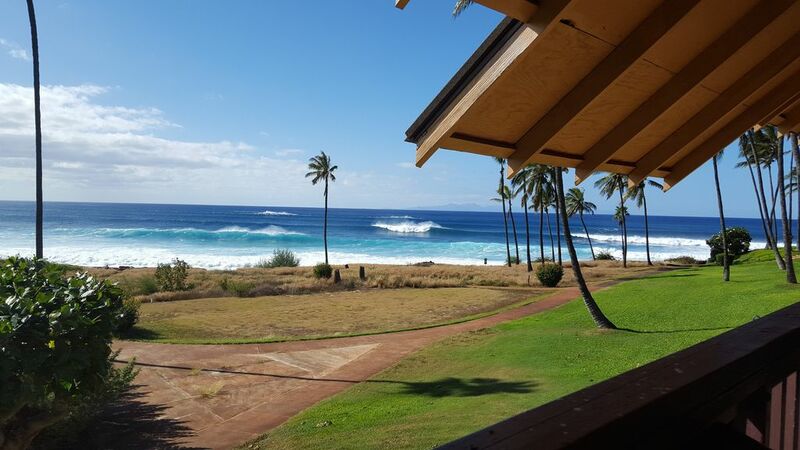 crashing waves make this a perfect Molokai get a way. This condo with its additional kitchen island, extra drawers and counter space added convenience for cooking and serving. Everything was furnished including a dishwasher, crockpot, blender etc. What a surprise to also find a washer/dryer behind the bdrm closet doors! Christmas holiday was the busiest we’d seen at this resort adding to the fun. Will recommend this condo to others. Thank you. Aloha Allan, We are really happy that you had a chance to experience our place in Molokai. Thank you so much for wonderful review. We look forward to your next visit. We spend 5 nights here in December coming from Maui and heading to Oahu. Although the ocean was a bit choppy, in retrospect this was the real vacation part of our trip. Not much to add to what already had been said, the property layout and its location on the bay exceeded our expectations. There is even a food store nearby open every day. Hosts have left a lot of useful information about the island and potential activities, so take a look at the beginning of your stay to be able to plan accordingly. Thank you Don and Jackie, you have a great place. Thank you Theodora for tje great review. So glad you had an enjoyable stay. We look foward to you return to Molokai. Romantic, Seclusion, Beautiful beaches, spectacular views, Skin Diving, Surfing, hiking. Cancellation Policy Guests will receive their full refundable deposit plus: •a 50% refund of their paid rental costs if they cancel at least eight weeks before the start of their reservation; or •a no refund of their paid rental costs if they cancel up to four weeks before the start of their reservation.